I had an extremely busy day yesterday and didn't get a chance to do this, so here it is today. I have been rather moved lately as I've read so many of my friends and family's posts about the gratitude they feel for the blessings in their lives, whether great or small. One friend of mine has even done a gratitude post every single day this month! It's been incredible and has really caused me to reflect upon the things in my life for which I am grateful. "A few years ago, two researchers conducted what they called the Research Project on Gratitude and Thankfulness. They found through science what most of us know intuitively: gratitude makes people happy. For the study, several hundred people were divided into three groups and asked to keep diaries. The first group listed the day’s events in their diaries, the second group recorded any unpleasant experiences they had during the day, and the last group made a daily list of things they were grateful for. The researchers found that the simple act of taking time each day to count your blessings makes a person more enthusiastic, determined, optimistic, and energetic. Those who expressed gratitude experienced less depression and stress, exercised more regularly, and made more progress toward personal goals. Researchers even noted a relationship between feeling grateful and feeling loved, and they observed how gratitude inspires acts of kindness and compassion. Remarkable, isn’t it? All this from daily gratitude and thanksgiving. Of course, the best way to discover the benefits of gratitude is not by observing them in an academic study but by experiencing the miracle for ourselves: When we daily count our blessings, we feel better about life, even in the midst of adversity; we garner a strength of character and largeness of soul that will help us through hard times; and we see life as basically good, despite its challenges and heartaches. 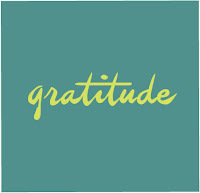 Gratitude does not need to be reserved for holidays and special events. Every day is filled with miracles and blessings. If we open our hearts and look, we’ll find reasons for gratitude and thanksgiving each day, all around us." I want to end by sharing a video I'm sure many of you have already seen because of the impact Christian & Stephanie Nielson's tragic yet miraculous story has had on so many lives. This clip from Mr. Nielson is one of purest heartfelt expressions of gratitude I have ever seen. P.S. I'm off to "Terrific Tuesday" with Bryson. I'll post pictures soon!